Improve Your Play with These Gambling/Gaming Books! Become a master player and money-maker with these fun and informative gaming books. Choose from rules guides for assorted card and board games, as well as over a dozen poker titles. 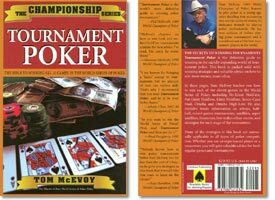 Our Poker Book selection includes works by masters of the game such as Mason Malmuth, author of over 500 articles and 14 books, Brad Daugherty, a World Series of Poker million-dollar winner, and Tom McEvoy, widely regarded as the world's best tournament player. Up To 40% Off List Price – Limited Time Offer! 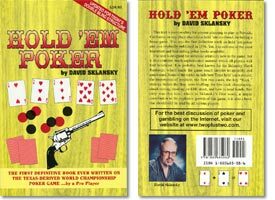 David Sklansky's Hold'Em Poker is a must-read for anyone planning to play in Nevada, California, or any place else where Hold'Em is offered including a home game. This was the first definitive work on Hold'Em poker, and it was originally published in 1976. Yet, Hold'Em Poker is still one of the best-selling poker books available. The text is designed for someone relatively new to the game, but it still contains much sophisticated material. The text is probably best known for the Sklansky Hand Rankings, which made the game much simpler to quantify and understand. Some of the topics include the importance of position, the first two cards, the key "flops," strategy before the flop, semi-bluffing, slowplaying, check raising, head-up on fifth street, and how to read hands. 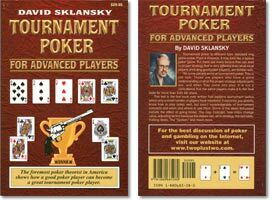 Not only was this text, which is Sklansky's first work, a major contribution to the explosive growth of this game, it is also a book that should still be read by all serious players. 113 Pages. Paperback. This new and expanded edition shows playing and winning strategies for all major poker games: Five & Seven Stud Games, Omaha, Draw Poker, Hold'Em, and High-Low, both for home and casino play. 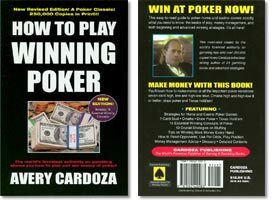 Readers learn the 15 winning concepts of poker, how to minimize losses and maximize profits, how to read opponents and gain the edge against their style, and use pot odds, tells, position, and leverage. 160 Pages. Paperback. 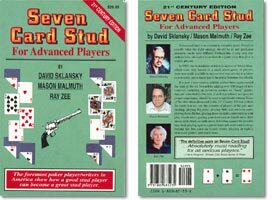 Seven-card stud is an extremely complex game. Deciding exactly what the right strategy should be in any particular situation can be very difficult. Perhaps this is why very few authors have attempted to analyze this game despite the fact that it is widely played. In 1989, the first edition of this text appeared. Many ideas, which were only known to a small select group of players, were made available to anyone striving to achieve expert status, and a major gap in the poker literature was closed. It is now a new century, and the authors have again moved the state of the art forward by adding over 100 pages of new material, including an extensive section on "loose games." Anyone who studies this text, is well disciplined, and gets the proper experience should become a significant winner. Some of the other ideas discussed in this 21st century edition include the cards that are out, the number of players in the pot, ante stealing, playing big pairs, playing little and medium pairs, playing three-flushes, playing three-straights, randomizing your play, fourth street, pairing your door card on fourth street, fifth street, sixth street, seventh street, defending against the possible ante steal, playing against a paired door card, scare card strategy, buying the free card on fourth street, playing in tightly structured games, and much more. 326 pages. Paperback. Tom McEvoy teaches you how to win each of the eleven games in the World Series of Poker, including No-Limit Hold'Em, Pot-Limit Hold'Em, Limit Hold'Em, Seven-Card Stud, Omaha, and Omaha High-Low. This book is essential for any player who wants to be in-the-know. 245 Pages. Paperback. Although, from a distance, tournament poker may look like a typical poker game, it is very different from standard ring game poker. There are numerous factors that players must be familiar with. Understanding these factors and developing proper strategy are critical to your success in Tournament Poker. This text is the first book ever written that explains tournament strategies - strategies that only a small number of players have mastered. Tournament Poker for Advanced Players assumes that you already know how to play poker well, but aren't knowledgeable of tournament concepts and when and where to use them. Some of the ideas discussed include the effect of going broke, The Gap Concept, how chips change value, adjusting strategy because the stakes rise, all-in strategy, the last table, making deals, The "System," and much more. 245 Pages. Paperback. For a FREE Catalog or additional information on Gaming Guides and Poker Books, please contact us at 1-800-233-0828.